Description: THE SILVER PALM arrives! 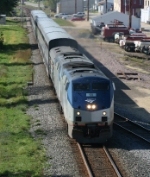 Description: The east bound Empire Builder roars through a little late. Description: This certainly was a surprise to see! Description: The Eastbound Three Rivers heads into the west end of the Allegheny Tunnel on track two. Description: It took me by surprise. It should have been in Tallahassee by that time. Description: So intent on catching up to the previous VRE that they didn't even stop in Fredericksburg. That's competition! Description: P091 screams by at 79mph through Hilliard, FL. Description: The Lake Shore Limited is about to cross over from track 2 to track 1 at CP 429. Description: Amtrak 80 passes the freight house at Salisbury with a pair of P42DC's for power. It is unusual for this Charlotte to New York "Carolinian" to have two units. Description: Only about 3 1/2 hours down, Amtrak #8 flies thru West Salem! Description: Train 302 approaches the Alton depot with a beautiful icy background. 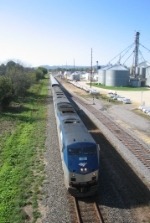 Description: Amtrak 18 leads a SB Amtrak at AY. 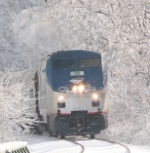 Description: Amtrak P092 heads up the Neve Spur for the reverse move. Description: Amtrak P092 reverses towards TUS. Description: Amtrak P092 departs Tampa. Description: AMTK 18 leading northbound Texas Eagle past Wicks Road crossing in far south St. Louis, MO, running about 1 1/2 hours late on a very muggy early July morning. As you can see, the baggage car desperately needs a new paint job!! Description: I believe that this was the Capitol Limited - running late, of course.